Xboom AI ThinQ WK9 is LG's answer to the Amazon Echo Show | What Hi-Fi? A screen-toting smart speaker with serious audio skills? 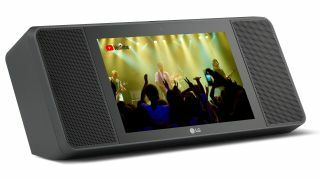 LG has announced a new speaker, the XBOOM AI ThinQ WK9, with a display and Google Assistant smarts built in. It sounds a lot like Google's answer to the Amazon Echo Spot in the UK and the Echo Show in the US, which both feature displays and the Alexa smart assistant. The LG WK9 is tuned by the guys at Meridian Audio, which LG says will set it apart from the competition. It also has an 8in HD touchscreen with 5MP camera. The speakers are both front facing and offer 20W of stereo power – making this the most powerful smart speaker currently on the market, according to LG. That should come in handy when listening to music, having video chats or watching YouTube. The WK9 is voice controlled using Google Assistant and the Android Things OS. This also means you can use voice commands to control smart connected gadgets such as Nest heating, Philips Hue lightbulbs or LG's ThinQ products including TVs and home appliances. A total of 10,000 smart devices from over 1,000 brands fit under this voice control system. So what's the catch? This is a US only product at launch and pricing has yet to be announced. The Amazon Echo Spot is £90, while the Echo Show is $230, but LG's offering is a lot more premium, so expect it to be priced nearer the £200 mark.